This lesson drills the different manoeuvres that the picking hand may encounter in playing situations. Developing these techniques enables the execution of any ideas that you may have while improvising and help you to master alternate picking technique. Exercises can be rather unmusical to practice, so to keep a goal in perspective I have included a rock style solo etude which combines the various picking exercises in a more musical environment, and I encourage you write other similar etudes to practice your various techniques in a musical context. Ex. 1 – The 1-2-3-4 ‘spider’ exercise has been serving the metal guitar community for years. However, I always thought that it made more sense to practice a proper chromatic scale (uninterrupted semitone steps) rather than just going across the fretboard. This means small position shifts are also incorporated, as well as being left with a usable piece of musical vocabulary under the fingers rather than just an exercise. Ex. 2 – This diatonic run is reminiscent of Dream Theater guitarist, John Petrucci, and one of his main influences, Steve Morse. It ascends through several positions within A Phrygian, employing sextuplets (6 notes/beat). Again, accent the first note of each beat, and be careful to nail each position shift. It may be beneficial to practice each six note fragment in isolation before linking them together. Ex. 3 – Moving on to two note per string playing, which lends itself to pentatonic playing, we travel the length of the fretboard using just the top two strings. These kinds of ideas are prevalent in the playing of players as diverse as Zakk Wylde, John McLaughlin, and Gary Moore. However, to give the lick a bit of extra interest, I’ve used the Robben Ford approved Am6 pentatonic scale, rather than the standard pentatonic scale, to give a subtle Dorian vibe (replacing the b7, G, for F#). Ex. 4 – As the number of notes per string decreases the frequency of times the pick must change string increases, and this presents the difficulty in alternate picking. So in this exercise only one note is played on each string before moving to a new one. Steve Morse is very fluent in this style and chooses to alternate pick where many others would opt to sweep pick instead. One note per string is usually employed on playing arpeggios or wider intervals. Ex. 5 – Play the B string with a down stroke and then upstroke the E string and repeat. 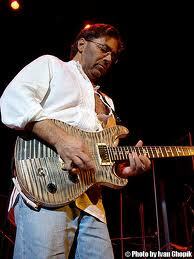 Now do the reverse: down stroke the E string and upstroke the B string. Did you find one motion easier than the other? Most players find the former (outside picking) easier than the latter (inside picking) but we should try to be fluent in both so as to not trip up when crossing strings. This example is more of a metal riff and alternates both types of picking due to the pattern alternating every 7 notes until the end pattern, which also incorporates string skipping. Ex. 6 – ‘Double picking‘ is less a specific picking technique and more of a melodic concept. What I mean by it is to repeat each pitch in a sequence (i.e. double pick each note). The difficulty is that as your fretting hand is moving at half the speed of the picking hand and it may take a little practice to coordinate the two hands properly. Randy Rhoads used it in his soloing, but this example is in the intricate riff style of Floridajazz-fusion/death metal band Cynic. Ex. 7 – String Skipping is just that – leaving a string or more out when travelling across the fretboard. By doing so, unpredictable and ear-catching intervallic leaps are interspersed with smaller steps. Paul Gilbert and Greg Howe employ this technique with stunning results. Here is a rather fiendish lick featuring increasingly wider string skips. Similar ideas are found in the playing of über shredder Michael Angelo Batio, and Chris Broderick of Megadeth. Ex. 8 – Being able to accent certain notes within a phrase really makes your playing three dimensional. Instead of a run of pitches just having a pitch contour, they can also have a dynamic contour too. Also, from a technical point of view, practicing accenting different notes within a pattern helps develop strength and control, as well as a better sense of how the beat is subdivided rhythmically. Ex. 9 – In modern rock playing odd groupings of notes are increasingly common. Accenting the start of each group can again be of great help in getting the pulse of these patterns into your ear. This two part example shows two ways in which phrases of 5 notes can be incorporated into your vocabulary. 9a are quintuplets, i.e. five notes crammed into the space of four semiquavers, with the pulse lining up with every crotchet. 9b keeps the ‘grid’ of straight semiquavers but every fifth note is accented, this is perhaps more difficult ‘feel’ but the resulting cross-rhythm creates a very ear-catching effect. Ex. 10 – Finally, and most importantly, we’re going to make music! 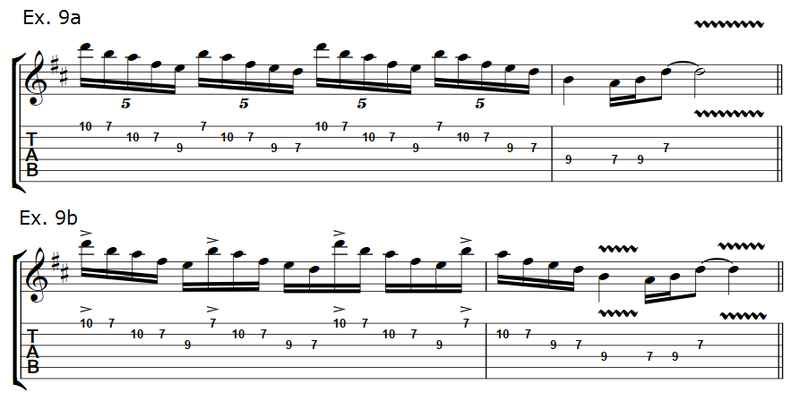 This semi-improvised solo aims to incorporate several of the aforementioned techniques so may be a little unbalanced compared to a real life example, but provides a greater sense of context than dry exercises. Bars 1-2 are more rhythmical and based on the pentatonic framework with a bluesy b5 and maj7 thrown in as passing notes. Aim to keep the picking hand moving in semiquavers to ensure the rhythmical flow. Experiment with palm muting to give these lower passages extra percussiveness. Bars 5-6 throw a rhythmical trick at the listener which may take a few listens to grasp fully. Firstly we are playing five notes per beat instead of four, but then every fourth one of these quintuplets is accented, generating a complex polyrhythm. For extra fun, try playing just the notes marked with the accents, without the ones in between! Bars 7-8 move around a simple Bb7 arpeggio in 6th position. Over C7 this provides a piquant, but not overpowering tension. For those interested in such things, this note choice of Bb7 is drawn from C Mixolydian b6, (the fifth mode of F melodic minor), which is considered a ‘non-resolving’ dominant scale, like Lydian dominant. Bars 9-10 contains another, much simpler, cross rhythm. The phrase ascends the G string in B Dorian, the lick hits warp factor with the ‘neoclassical’ sequence to end. Be careful to take your time, both in synchronising your hands with these position shifts, and control with the shift of speed in the final two beats of bar 10. Bars 11-12 continue in the neoclassical vein with the question-and-answer string skipping phrases, and the descending pedal point lick. These ideas are straight out of the 80’s ‘shred’ vocabulary, and exploring the plethora of J.S. Bach’s harpsichord music would give you many more licks in this style, direct from the source! Bars 13-16 The final four bars are really one long sextuplet picking lick. The first two are bluesier in their note choice and have the repetition associated with rock licks, while the final bars draw from C Lydian dominant. Look up Steve Morse Paul Gilbert particularly for this melding of both ‘classical’ and ‘blues’ note choices with the fast picking style. Happy picking, and remember to take it easy when practicing these drills. Mastery of them only comes with a lot of time and repetition, but so do bad habits (and injury!) so listen to your body, keep relaxed, and never play through any pain. It’s a hard pill to swallow to start with but striving to play them perfectly cleanly, slowly, without even trying to build speed at all, with pay dividends.